Scarlett looks better than usual - less stiff and cold? Also love Tiffany Haddish's dress! So happy for Thandie! Her work on WW is off the chain! Agree with Ophelia - Scarlett looks better this carpet. Great color on Thandie. I have never in my life seen someone built like Chrissy Metz. Haddish's dress looks like a circus tent!! Wonder what secrets her big mouth will spill about the Emmy's. Tiffany's dress looks cute on her. It's fun and unexpected. 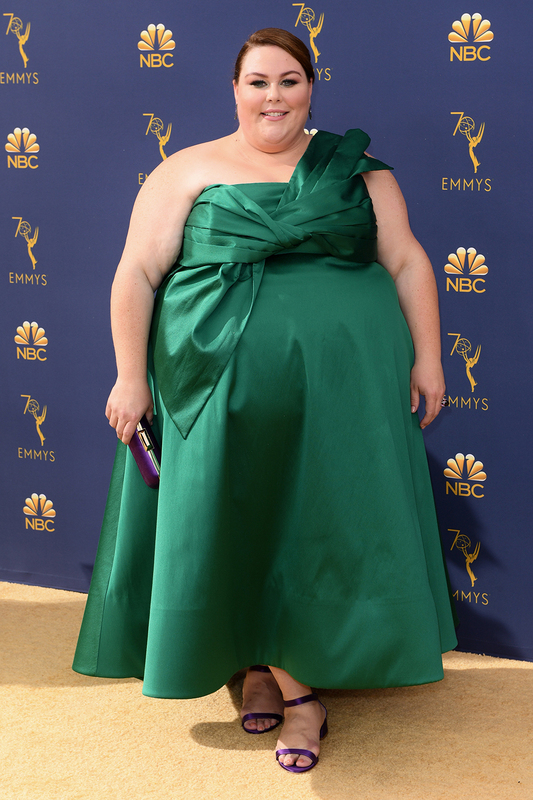 Once upon a time, stylists would have put Chrissy Metz in that dress. Her green thing is not good, but let's be glad she's not forced into ridiculous clown clothes like they used to put on Mama Cass. Talk about your circus tent! Not a fan of the color pink due to bad experiences with Pepto Bismal but Thandie looks like a goddess! Perfect fit hair is fancy and not outlandish, tasteful jewelry!! The winner this round for the ladies is Thandie Newton, elegant as always, that outfit whispers "star"
Winner for the guys is Matt Smith by default. 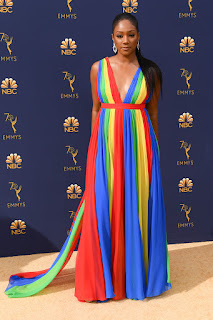 Tiffany Haddish gets honorable mention for her dress's color pattern reminding me of my parents' beach umbrella when I was a child, haven't thought of that in years. You've not seen Star Wars or Free Willy? Chrissy obviously just does not care. There are many women who are heavy as her, and dress beautifully, pants, a top and a jacket, or heck, even some 50s style rock'billy type clothing. but every single time she goes out, she is dressed in the most hideous unflattering design they can find. for hecks sake, my ex sister in law was bigger than her, and even SHE looked somewhat okay when she dressed in clothes that at least fit somewhat and drew attn SOMEWHERE. again, a nice dress that is lighter color on top and darker on bottom with a small belt LOWER than just below the chest which is what she usually does. Or a skirt and top with a jacket, I mean, even a longer dress, a tad bit more fitted with the waist dropped down and lower. Its NOT hard to look at least SOMEWHAT okay. That being said. man i want a department store version of that Issa Rae look. Oh Chrissy Metzz....my God that is bad. 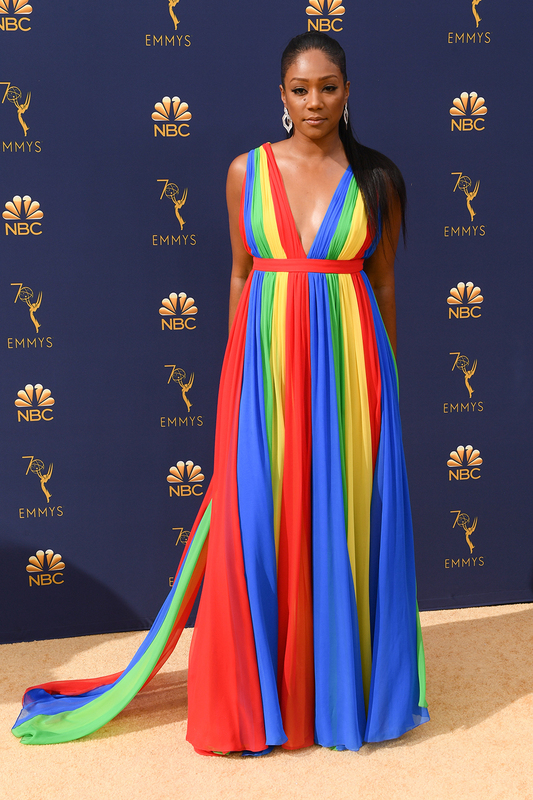 Either several homes in San Francisco are missing their pride flags or Tiffany Haddish found a cache of leftover clothes from the 1960's TV show "The Prisoner". I'm sorry but Scarlett has hit the wall. The white trash tattoos no longer look young and fun, they look white trashy. She keeps herself too thin for her face and her hair is an ongoing disappointment. Go to the mall in any American city. But really, what is the point of commenting at all. It reflects a rather small, rather ordinary brain. Chrissy Metz needs to fire her stylist. Obviously she is bigger than most bigger stars but look at Adele and her trademark Jenny Packham dresses or Aidy Bryant in her cute, fun, young dresses or Melissa Mccarthy when she was heavier. They all usually look/looked beautiful. Metz needs something floor length, with sheer long sleeves, a normal pump or even ballet flat. This looks like they just took one of those things of fabric from Joann's and wrapped it around her, tied it in a bow at the top and said "Finished!"